After talking with a salesman at Hardwood Floor Specialists, I cancelled an appointment for another bid as I felt comfortable with him. From start to finish everything went smooth and the installers did an excellent job. I am more than satisfied with the finished product. 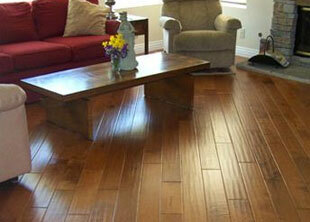 At Hardwood Floor Specialists, we make house calls for any wood flooring repair. Our family owned and operated company has performed the highest quality wood and hardwood flooring repairs in Orange County for three generations, all at an amazing value. We'll take on any type of repair in kitchens, family rooms, living rooms, stairways, and more. Hardwood and wood flooring naturally undergoes some degree of degradation over the years. When this happens, our experts can repair your wood or hardwood floor to like-new condition at the most competitive rates. If your floor has large cracks and splits, you may require a total refinishing job, but if not, you may require just a single plank replacement. If you need a plank replaced, we can match the new plank perfectly with the rest of your wood or hardwood flooring. We will use the same type of wood and match it to the closest age. Then we'll stain the wood to create a seamless fit with your existing floor. Your floor will be even, beautiful, and better than new; you won't notice any variation. Call Hardwood Floor Specialists today to schedule an estimate, or to ask any questions you may have; our experienced staff will provide you with expert knowledge and answers.